These festive banners show off your holiday spirit. 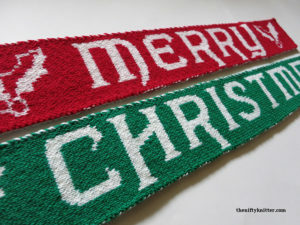 Bright and bold, they display a cheerful “Merry Christmas” greeting. 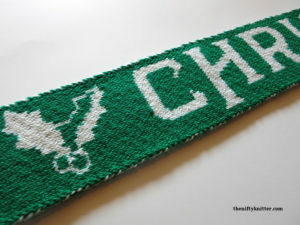 The banners are constructed using double knitting, and feature a checkered pattern on the back. There is also an option to knit them using the more traditional double knitting technique, resulting in the reversed pattern on the back. 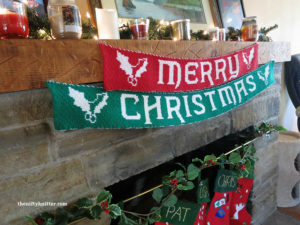 The finished size of the “Merry” banner is approximately 5.5” (13.97 cm) by 38” (96.52 cm). The finished size of the “Christmas” banner is approximately 5.5” (13.97 cm) by 51” (129.54 cm). Note: This is note a typical double knitting pattern. The back and front are different, so this design is fairly complicated. If you would like to try a simpler double knitting design first, I suggest my Fire Dragon Scarf or another simple double knitting design. Approximately 210-230 yards of red yarn for “Merry” banner (background color). Approximately 290-320 yards of green yarn for “Christmas” banner (background color). 125-140 yards for “Merry” banner (foreground color). 165-180 yards for “Christmas” banner (foreground color). 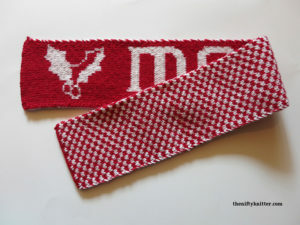 Note: The finished size will be more accurate if you knit your gauge in double knit.